This route takes you west of Green River to the wild and tortured landscape of the San Rafael Reef. 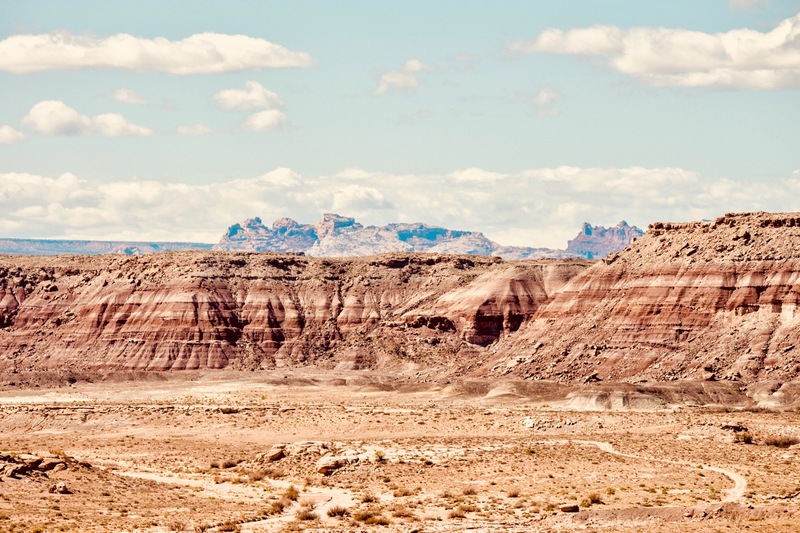 Cut through with deep, sinuous canyons adorned with ancient rock art panels, the Reef is the spectacular eastern cliff line of the San Rafael Swell. Within the Reef lies the deep Black Dragon Canyon, named for the flying dragon pictograph located on its wall. From Green River, drive west on Interstate 70. Carefully turn right on to the dirt road at mile post 147. One mile after the gate, turn west towards the canyon. Once in the mouth of the canyon park your car. An old jeep track provides a level walking surface for most of the hike. Walk 0.2 miles into the canyon to view several ancient pictographs and petroglyphs at the base of the high wall on your right behind a wooden fence. Many believe the illustrations on this panel are an early calendar. Up the canyon wall are more pictographs, one of which is the flying dragon. At your own risk, hike along the rockfall to find a secret cave rumored to be the dragon’s lair. Beyond the panel, after less than two miles the canyon forks. The south fork heads back towards Interstate 70. The north fork offers more fascinating canyon walls. Carefully return to I-70 when you’re finished exploring the canyons.